The seat belts used in cars and trucks are supposed to protect drivers and passengers, but many lap belts, particularly in older cars, can actually cause more injuries than they prevent. Victims of unsafe seat belts have suffered devastating spinal cord injuries, traumatic head injuries, and even death. The attorneys at The Law Offices of Frank L. Branson know that front-end vehicle accidents result in the most severe injuries for lap belt users because of the pressure that is focused on a person’s waistline. 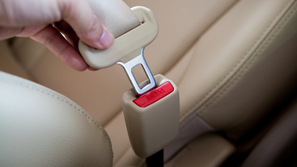 This danger remains for many drivers and passengers in vehicles manufactured before 2007, when more effective lap-and-shoulder belts were required for every seat in every vehicle sold in the U.S. Unfortunately, because of their size, children are the most common victims of dangerous lap belts and seat belt injuries. Motor vehicle accidents cause more spinal cord injuries among children than any other factor, according to the National Institute of Medicine. To learn more about our experience in lap belt spinal cord injury matters, we invite you to contact the firm here.